After two years of operation we have not heard of any issue that stopped the instrument from recording accurate pressure. However because the instrument is often on vessels offshore, sometimes without convenient communications, we offer the notes below. • The default welcome screen seen will present the option to change the time display from UTC to a preferred local time zone. If this does not appear, then the unit has likely been turned on for demonstration or testing. Local Time Zone is set in the Set-Up / Units, Timezone screen. • If the unit had been powered on previously, depending on the power-on history, you will see briefly upon first power-up several screens as shown. These only appear after a period without power. They show the data files synchronizing past pressure records with the present time. It should just take a second or two to update, depending on how long the instrument had been running earlier. This is a normal function of the instrument, which stores data with real time stamps. 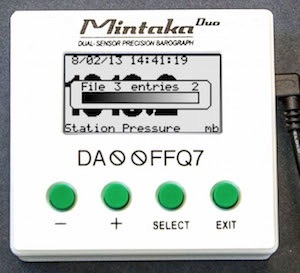 There are 10 files with 750 pressures each; one file for 15-second steps on up to 1-day steps. • Time off by some seconds. If you plug and unplug your device frequently you may have noticed that the time has drifted a few seconds. Update to the latest firmware and reset the clock to resolve that issue.